This is a delicious dish to use up those autumn blackberries. It's a really lovely pairing. 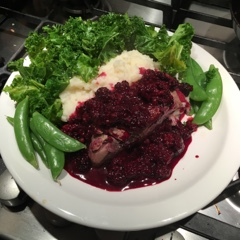 I served it with cauliflower mash, sugar snap peas and kale. Place the duck breasts, skin side down, in a frying pan. Cook over low heat until the fat is rendered and the skin is golden and crisp. Meanwhile, melt the butter in a small frying pan, add the sugar and the berries, and stir, crushing with the back os a wooden spoon until they begin to bubble. Deglaze the pan with a splash of sherry vinegar. Add the chicken stock, reduce a tiny bit and set aside. Finish cooking the duck breasts, skin side up, for 3 mins. Pour any juice from the duck into the sauce. Reheat lightly. Serve the duck topped with the sauce.